Rosemary Tarte Tatin. Where'd You Go, Bernadette? I’ve spent the past couple of months looking for any possible opportunity to invite people over for dinner. After two years living in other people’s homes, always a little bit in the way, I have my own space again. It is, of course, lovely to put my books back on shelves, and get my favourite sheets out of storage, but it is in the kitchen that I am most appreciating the freedom to invite people round whenever I fancy. It also helps that I am midway through recipe testing for my second book, and that the seemingly never-ending parade of food across my dining table needs to be eaten. In Stroud, my new home, I have friends in houses up and down the street, only too happy to bring a bottle of wine and a tub of olives, and to muck in with the washing up. It’s the sort of entertaining I most like; casual and unfussy, with a seat at the table for as many people as fancy showing up. None of the plates, cutlery, or glasses match, and the dishes never really go together (I end up testing bits and pieces of whatever is in season, or most urgently needs trialing). It’s the antithesis of the brunch in Where’d You Go, Bernadette?, a meal so carefully and meticulously planned that it can only end in catastrophic disaster. I can’t spoil how it all inevitably goes wrong (it’s too funny, perfectly foreshadowed, but still utterly unexpected – if you haven’t read the book, do get your hands on a copy), but suffice it to say that I don’t feel like the brunch crowd made it to Audrey Griffin’s rosemary tarte tatin. The book is mostly a collection of correspondence – emails, articles, letters, incident reports – pulled together by 15-year-old Bee after the disappearance of her mother Bernadette. Though it addresses post-partum depression, isolation, agoraphobia, and anxiety, it is genuinely funny, and a joy to read. It’s also filled with great Seattle food: a visit to Pike Place Market, salted caramel ice cream from Molly Moon’s, endless take-out, a visit to a Mexican restaurant. My sister and her husband moved to Seattle a few years ago, and we spent a happy fortnight in 2015 eating our way around the city; I’d have happily worked on a recreation of one of our meals. But on Sunday night, a friend whose sofa I made my home in London this week was speaking wistfully about a tarte tatin. I remembered Audrey Griffin, and was only too happy to oblige. 1. Preheat the oven to 180C. Line the base of your pie dish with a disc of greaseproof paper. Cut a disc of pastry that is a centimeter wider than your pie dish, prick it with a fork a handful of times, and place in the fridge until you need it. 2. Peel the apples, slice into quarters, cut the core out, and then make slices into the rounded side, like you’re preparing Hasselback potatoes, being careful not to cut right through the apple. Don’t worry about rubbing them in lemon or keeping them in water; they’ll be covered in caramel before long, so a couple of brown spots shouldn’t worry them. 3. Tip the sugar into the saucepan, and melt over a medium heat until it is a rich amber colour – like the stuff that surrounds the mosquito in Jurassic Park. Take off the heat, and whisk in the butter. Tip into the pie dish, and add the rosemary. Arrange the apples Hasselback side down in the caramel. Put into the oven and cook for 20 minutes. 4. Turn the heat up to 200C, and remove the dish from the oven. Being very careful not to touch the caramel, place the chilled pastry over top of the apples, and use a knife or a spatula to ease the edges down the sides around the apples. Return to the oven and bake for a further 25 minutes, until the pastry is puffed and deep golden brown. 5. 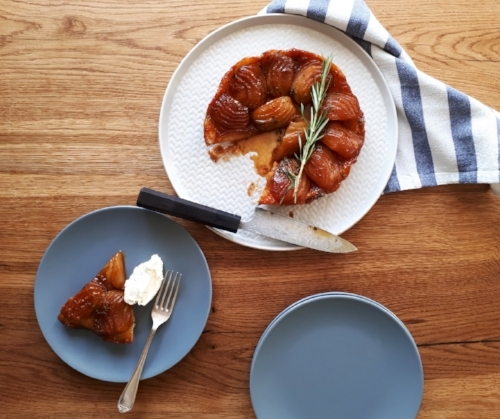 Remove the tarte tatin from the oven, and allow to cool for five minutes. Place a board or serving plate securely over the top of the dish, and (holding it all firmly in place) quickly and confidently invert the dish, so that the pastry is on the bottom. Watch out for any hot caramel that might escape. Serve immediately with sour cream.